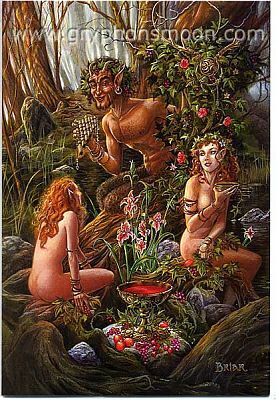 - Deep in the heart of the forest, lusty goat-footed Pan plays his pipes for a pair of wanton nymphs. Card measures 8" by 5 1/2"
If you have never seen the artwork of Briar, you are in for a real treat. Briar is one of England's leading mythological artists. His subjects evoke a time of ancient magic and mystery. Cards are individually wrapped with cellophane. Inside is blank. Do you have any other questions about our IO Pan Greeting Card?